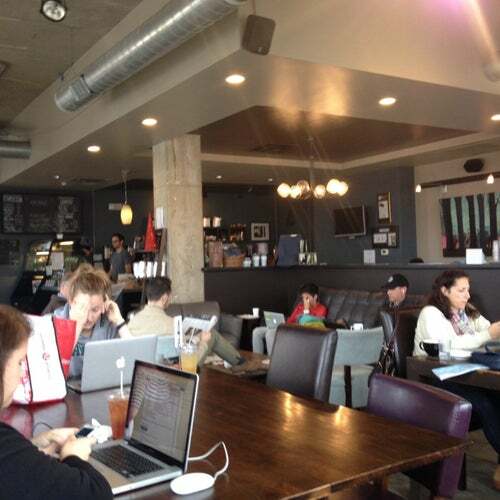 Housed in a large, open space so it never gets too steamy or stuffy, Ugly Mugs has plenty of local young coffee drinkers smiling. Live shows and readings are a big part, as the coffeehouse aims to be a community art space in the area. The Classic breakfast sandwich and a latte are a great way to start a Saturday morning on the way to the Shelby Dog Park. What's up with the name, you may wonder? Well, you just might get your drink served to you in an "ugly mug" (but they also have paper if you prefer). Friendly baristas, and they still actually MAKE the drinks, not just push a button like many coffee shops these days. The food is also good. But what we love most about it is that it's open and airy - they even have large commercial garage doors they can open when it's pleasant. So whether you're there with one friend or 15 (we have coffee gatherings there at least once every couple of months) you can find a place to enjoy your cup 'o joe. Of course complimentary Wi-fi as you'd expect. THIS is why we love East Nashville! So many places to check out within a mile of your home!